Welcome to my city pages!!! 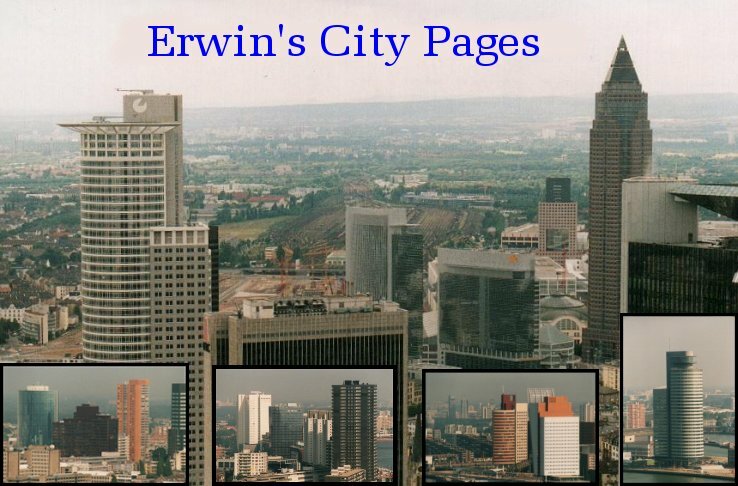 On these pages you'll find pictures of several cities. Frankfurt and Rotterdam are the main cities, they each have their own homepage. Paris is the third city that has it's own homepage. The area of La Defense will be the most important Paris area but the huge National Library as well as Gare Montparnasse (Jardins Atlantiques) will be on display. Below left there are three other cities, of which pictures are included. If you want to see photos of one of these cities, just click on the name of the city in the list to the left. In the right column you can see what the latest changes are. Further down you can find some interesting links to other skyscraper sites. A links page is under construction. Copyright of all pictures (except London & Essen): Erwin Blezer. Feel free to send email with suggestions, questions, whatever: don't hesitate, email or ... sign my guestbook! Layout & textual changes. Links removed. Nothing added. A very large site, with lots of pictures and a database with drawings of skyscrapers. Skyscraper Forum Here you can find the latest developments in skyscraper-world. A huge database, the best on the net. Linkspage: page containing huge number of links to highrise pages and cities.